Martin Short, Mara Wilson and Kathleen Turner star in this effects-filled children's film. 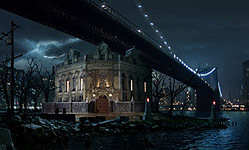 Matte World Digital created this composite with a digital matte painting of the New York skyline and bridge, and added animated lightning and water. The house was shot on location in Toronto.